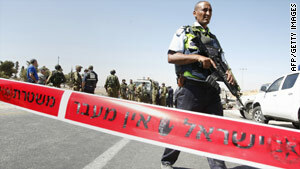 Israeli police officers work the crime scene Monday after three officers were ambushed by gunmen near Hebron. (CNN) -- One Israeli policeman was killed and two others were wounded near Hebron in the southern West Bank early Monday, authorities said. Security forces are searching the area for the shooters. The three officers were taken to Hadassah Ein Kerem hospital in Jerusalem and Seroko Medical Centre Beer Sheva for treatment, according to police spokesman Micky Rosenfeld. The last Israeli shooting victim in the West Bank was Jewish settler Rabbi Meir Avshalom Hai, 40, from Shavai Shomron. He died shortly after being shot in the head in December 2009.